Careful design has reduced the total overall height to a mere 3 inches, little more than the 2.6 inch height of one NEMA 23 motor. 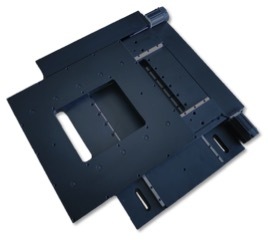 It is a unique product that combines two axes together and maintains very high standards for positional accuracy, linear accuracy, and orthogonality. All unnecessary mass is removed without compromising accuracy or torsional stiffness. 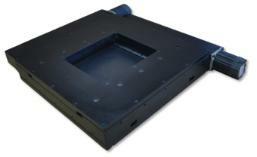 As with any of our products, customization to fit specific applications is no problem. Precision rolled ball screws are standard and provide a high level of positional accuracy with minimal backlash. Ground screws are available as an option.